(Nanowerk News) Galaxy clusters are the largest objects in the Universe held together by gravity but their formation is not well understood. The Spiderweb Galaxy (formally known as MRC 1138-262 ) and its surroundings have been studied for twenty years, using ESO and other telescopes , and is thought to be one of the best examples of a protocluster in the process of assembly, more than ten billion years ago. But Helmut Dannerbauer (University of Vienna, Austria) and his team strongly suspected that the story was far from complete. They wanted to probe the dark side of star formation and find out how much of the star formation taking place in the Spiderweb Galaxy cluster was hidden from view behind dust. The team used the LABOCA camera on the APEX telescope in Chile to make 40 hours of observations of the Spiderweb Cluster at millimetre wavelengths — wavelengths of light that are long enough to peer right through most of the thick dust clouds. LABOCA has a wide field and is the perfect instrument for this survey. Carlos De Breuck (APEX project scientist at ESO, and a co-author of the new study) emphasises: "This is one of the deepest observations ever made with APEX and pushes the technology to its limits — as well asthe endurance of the staff working at the high-altitude APEX site, 5050 metres above sea level." The APEX observations revealed that there were about four times as many sources detected in the area of the Spiderweb compared to the surrounding sky. 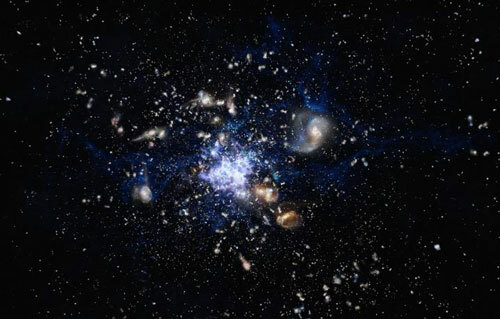 And by carefully comparing the new data with complementary observations made at different wavelengths they were able to confirm that many of these sources were at the same distance as the galaxy cluster itself and must be parts of the forming cluster. Helmut Dannerbauer explains: "The new APEX observations add the final piece needed to create a complete census of all inhabitants of this mega star city. These galaxies are in the process of formation so, rather like a construction site on Earth, they are very dusty." But a surprise awaited the team when they looked at where the newly detected star formation was taking place. They were expecting to find this star formation region on the large filaments connecting galaxies. Instead, they found it concentrated mostly in a single region, and that region is not even centred on the central Spiderweb Galaxy in the protocluster . Helmut Dannerbauer concludes: "We aimed to find the hidden star formation in the Spiderweb cluster — and succeeded — but weunearthed a new mystery in the process; it was not where we expected! The mega city is developing asymmetrically." To continue the story further observations are needed — and ALMA will be the perfect instrument to take the next steps and study these dusty regions in far greater detail. The Spiderweb Galaxy contains a supermassive black hole and is a powerful source of radio waves — which is what led astronomers to notice it in the first place. This region had been intensively observed by a variety of ESO telescopes since the mid-1990s. The redshift (and hence the distance) of the radio galaxy MRC1138-262 (the Spiderweb Galaxy) was first measured at La Silla. The first visitor mode FORS observations on the VLT discovered the protocluster and afterwards further observations were made with ISAAC, SINFONI, VIMOS and HAWK-I. The APEX LABOCA data complement optical and near-infrared datasets from ESO telescopes. The team also used a 12-hour VLA image to cross-identify the LABOCA sources in the optical images. These dusty starbursts are thought to evolve into elliptical galaxies like those seen around us today in nearby galaxy clusters.